Cupertino giant Apple emerged as the leader in the wearables market as the Apple Watch shipments stabilised for the company and they even matched the number of Q1 2017. Canalys has reported that Apple managed to ship 3.8 million Apple Watch units during the quarter and the key for Apple’ success was the presence of LTE support in the Apple Watch Series 3. 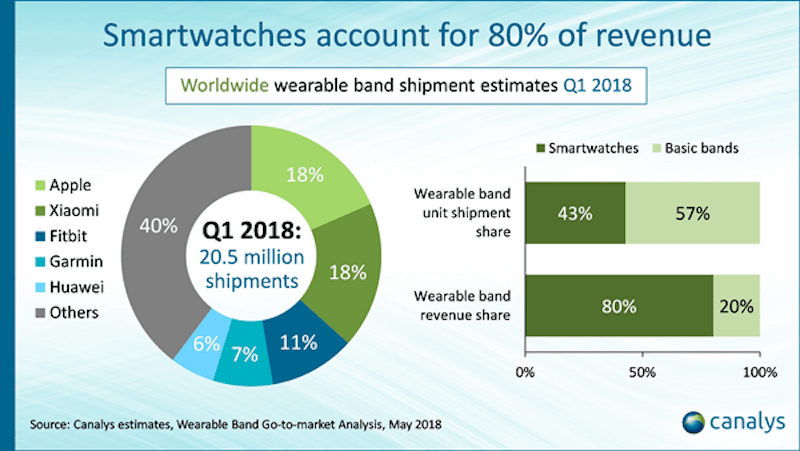 It was also reported that Wearable band shipments grew 35% YoY to 20.5 million units in Q1 2018, which is driven by the strong demand for health-centric devices. Smartwatches accounted for 80% of wearable band revenue, up from 74% in Q1 2017. In terms of shipped units, smartwatches accounted for 43% in Q1 2018. Apple emerged as the top vendor, shipping 3.8 million Apple Watches; Xiaomi, whose Mi Bands account for more than 90% of its shipments, was close behind, shipping 3.7 million units. Fitbit, Garmin and Huawei, vendors selling a mixed portfolio of fitness wearables, rounded out the top five. “Key to Apple’s success with its latest Apple Watch Series 3 is the number of LTE-enabled watches it has been able to push into the hands of consumers. Operators welcome the additional revenue from device sales and the added subscription revenue for data on the Apple Watch, and the list of operators that sell the LTE Apple Watch worldwide is increasing each month,” said Canalys Senior Analyst Jason Low. Apple represents 59% of the total cellular-enabled smartwatch market. “While the Apple ecosystem has a strong LTE watch offering, the lack of a similar product in the Android ecosystem is glaring. If Google decides to pursue the opportunity with a rumoured Pixel Watch, it will jump-start much-needed competition in this space,” he added. Garmin, which is known for some innovative smartwatches is now the second largest smartwatch vendor after Apple with one million smartwatches shipped during the quarter. “Garmin’s transition to smartwatches has been swift as it focuses its GPS expertise on catering to endurance athletes and outdoor enthusiasts. It brought much-needed improvements by adding features such as Garmin Pay to the Forerunner and vívoactive series and now offers onboard music storage on the latest Forerunner 645. While launching services is a great way to build stickiness, Garmin must ensure it continues to enhance them based on real use-cases. The exercise could prove costly should Garmin be the sole driver of such an ecosystem,” said Vincent Thielke, Research Analyst at Canalys. Popular brand Fitbit is also racing to get its users to upgrade to smartwatches and to attract new users amidst fierce competition from other players. Xiaomi doesn’t have any smartwatch available in the global markets, but it’s still the second largest wearable company across the globe.